As you may have deduced, I’m an Indian food junkie. When I first moved to Britain and realized how ubiquitous Indian food is here, I was delirious with joy. I’ll never forget my first day in Edinburgh, how driving through the city I nearly jumped out of my seat with each new Indian restaurant we passed – the Delhi Diner, the Bombay Bicycle Club, the Taj Takeaway… Visions of tamarind chutneys, saffron-laced sauces, spicy kebabs and koftas danced dizzily before my eyes as I quickly tried to calculate if my student stipend would reach to cover Indian dinners seven nights a week. That first night Manuel and I bypassed the supermarket and made a beeline for the nearest Indian restaurant, not even stopping to read the menu. We figured that with so many vying for diners’ business, they must all be good, right? Wrong. That dinner was beyond awful. We ordered two meat curries, two vegetable side dishes, some rice, naan and lassis, and the only good thing I could say about any of this was that the rice was well cooked. One of the meat curries had unnaturally-textured pieces of chicken breast floating in a tasteless, insipid sauce, while the other curry was so scorchingly hot that we almost couldn’t tell that it was the exact same sauce apart from the kilo of hot chiles they’d added. There were no velvety, unctuous sauces, no pungent aromas of garlic and ginger, no subtle fragrance of spices – in short, no taste whatsoever. I remember we paid a small fortune for that meal, and slunk out with our tails between our legs, praying that by some freak accident we’d ended up at the only bad Indian restaurant in Edinburgh. How I wish that had been the case. I have since learned that mediocre Indian restaurants have a long history in Britain. In the early 1950s, when the first wave of Indian immigrants opened up restaurants, they quickly discovered that in order to sell any food (for they couldn’t just feed the Indian community, since they mostly cooked and ate at home), they needed to please local tastes. At that time anything like Indian food would have been very unfamiliar to the majority of the island’s inhabitants, and these new food entrepreneurs had to figure out ways to not only make their food palatable, but also cost-effective. What was born is now referred to as the “Indian restaurant secret”, but it’s actually not much of a secret. These early restauranteurs came up with a formula that would form the basis of nearly every sauce the restaurant used, and it was basically just a mixture of tomato puree and oil. On top of that they would add cheap spice mixes and powdered garlic and ginger, along with other things to distinguish the sauces from one another. Liberal amounts of cream went into the famous ‘Korma’, things like bananas, pineapple and coconut were added to make ‘Malay’ and ‘Kashmir’ curries, and everything else was basically just a variation of the tomato-oil-powdered-spice formula with different vegetables and meats. It was obviously a hit, because Indian food quickly took off in popularity and within a relatively short span acquired the iconic status it has today in British culinary culture*. The only problem was that as tastes for everything else changed over the years, many of Britain’s Indian restaurants stuck to this tried-and-true formula, with generation after generation of Indian restaurants succumbing to the bland monotony of the ‘Indian restaurant secret’. Obviously every rule has an exception, and good Indian food can be found if you look hard enough. Of course there are sleek, stylish, ‘Indian interpretation’ restaurants in every British big city by now, where you pay enormous sums of money for small portions of artfully-arranged, innovatively-flavored subcontinental cuisine. What I’ve been searching for, however, is a restaurant that has no Euro-chic pretentiousness, no high prices, just generous portions and generous flavors. At the top of my list for exactly this style of food is a little restaurant on Edinburgh’s south side, near the University, which has developed a delightful fusion between Scottish humor and Indian cooking. Suruchi Restaurant is tucked up some stairs in a slightly claustrophobic space and has decor that reminisces of someone’s aging Indian grandmother. That’s easy to overlook, however, because the service is friendly, the food is magnificent, and to top it all off, the menu is in Scots. 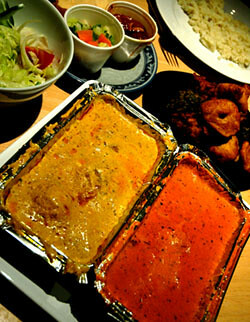 They have the best Butter Chicken in the city, a velvety, slightly sweet blend of tomatoes, cream, butter, and spicy tandoori chicken. They have Lamb Malabar, which has tender pieces of lamb simmered in a chunky toasted-coconut sauce, or Chicken Nirvana, which blends chicken with South Indian flavors of coconut milk, mustard, lemongrass and curry leaves. Their meat kebabs are magnificent, spicy and succulent, as are their vegetable pakoras, little balls of perfectly spiced fried chickpea batter (which come with some mango chutney so good I end up licking the bowl…). Another unusual offering is their Simla chaat, which is kind of like a spicy pickled salad, enlivened with potatoes, cilantro, crunchy chickpeas and banana. While the restaurant is pleasant enough to eat in, we mostly end up getting takeaway food, because at Suruchi it represents such a good deal: while most of their main dishes hover in the 7-9 pound range, a takeaway order for one has any starter and almost any main dish you want with rice or naan included and costs a mere £8.50. Such a deal! And for those who need a little more Scotland with their India, Suruchi is the (as far as I know) only restaurant in the world to offer haggis pakoras – and believe it or not, they are tasty. *At work we have a microwave that provides pre-programmed settings for the foods most commonly eaten in the UK. Number one on that list, above bread, jacket potatoes and chicken, is ‘curry’. No one can figure out how much curry this setting is supposed to heat, or what kind of curry – meat, vegetable, beans, thick sauce or thin? – but it’s clear that somebody somewhere must be pretty confident of what this mystery curry must be! yummmm! great stuff. this was the very first restaurant i went to when i moved here, i’d forgotten all about it! the menu is fantastic.